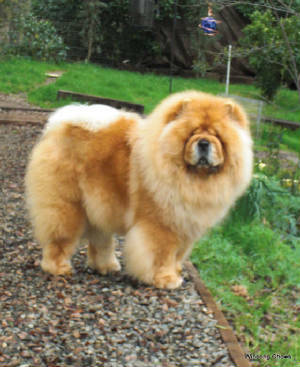 Chunky is one of a few chows who gaits with his head upright. Along with his stilted movement this creates a stunning sihoulette. Our resident star has recently informed us that he does not like to show in the hot weather or more than two weekends per month. That makes showing him a bit difficult. Amanda has created a monster!! For now he's busy raising his nephew Tank and daughter Mary Margaret. We would like Chunks to become a therapy dog since he's so outgoing & loving with everyone he meets. Ch. Winsong's The Kinsman, aka Chunky Monkey, began his show career a little late, at the age of 9 months. Another puppy chomped out a patch of fur during playtime when he was a few months old, so we had to wait for his fur to grow back. Chunks has a beautiful arch of neck which he uses while gaiting, a good front, nice length of leg, a short back, stilted movement, and a great show attitude. We are proud of his show record, in addition to Chunky’s winning personality & temperament. He gets along with dogs of all sizes, male or female, and loves cats too. Amanda insists he's perfect, but as his breeder I'll tell you every dog has his flaws. Chunky has been taking some time off to mature into an adult chow. He has also been busy with the ladies, producing numerous kids, most of whom share his delightful personality, silly little quirks & love of toys. ***We appreciate all the interest in Chunky Monkey, however this boy is not for sale. First and foremost he is a cherished family member. We could never part with him. Chunks is a housedog and would languish in a kennel. Also Amanda is probably the only person who is willing to cater to Chunky's every whim, including the daily preparation of gourmet meals, spoonfeeding and/or handfeeding him those meals. This boy is spoiled! !